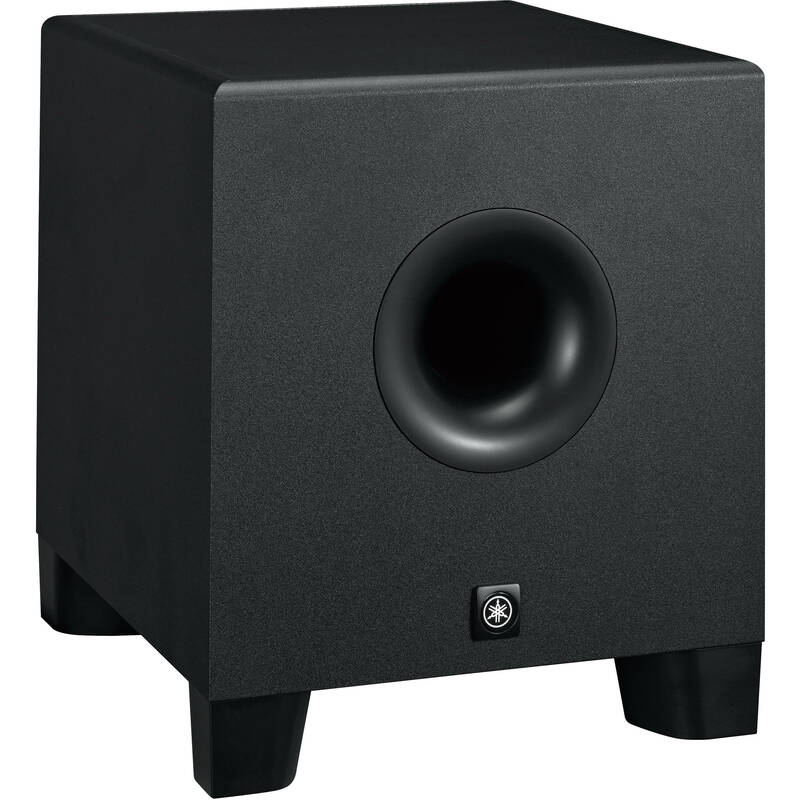 The HS8S 8" Powered Subwoofer from Yamaha features an eight-inch cone woofer that is capable of up to 150W of output. It can reproduce frequencies down to 22Hz and features variable low and high cut filters between 80 and 120Hz. You can connect to the HS8S through its stereo XLR or 1/4" TRS inputs. It also has stereo XLR extension sub outputs. Dimensions (W x H x D) 11.8 x 13.8 x 15.3"
Box Dimensions (LxWxH) 18.9 x 18.1 x 16.2"
HS8S 8" Powered Subwoofer is rated 5.0 out of 5 by 2. Rated 5 out of 5 by Giovanni E from It is good! I like a lot, if fits very well under my table and it is almost invisible. I had the Yamaha HS8 Powered monitors for about a year, I thought that were big enough as to render a good bass but now that I have this subwoofer the difference is day and night. I thought that the value is good as well. I mostly do voice-overs and radio commercials. Can you turn the sub's volume down and still hear your monitors when connected? Essentially can you bypass the sub when powered on, for just the monitors? Your stereo pair will operate independently of the sub and will not be affected by its volume level. The sub may be bypassed completely as well. Does the high cut knob act as a crossover? Will the frequencies above the set high cut pass through the HS8S's outputs to go to studio monitors? On the HS8 subwoofer, the high cut control sets the highest frequency output from the sub. The Low Cut control will act as the crossover to the monitor speakers and attenuate the low frequencies before outputting to the connected monitors. This can be bypassed or engaged with the on off switch. Can this be used with HS80M monitors? I've noticed that this subwoofer has a very different frequency response curve to the now discontinued HS10W subwoofer that was designed for the HS80M monitors. Contacted Yamaha and they assure me that it can be used with HS80M monitors. Frequency response is different as the HS8S can go as low as 22hz (HS10W was 30hz). You just need to adjust the cross over frequency until it best complements the HS80M monitors.